The Florida Gators got their jaws clamped around the Alabama Crimson Tide early and never let go as they used their defense and Jalen Hudson’s shot making on route to an overwhelming 73-52 victory. It didn’t matter who was on the court at any given time on defense as Florida was locked in, quickly rotating on dribble penetration to not allow any open jump shots and constantly using their hands to poke away balls for turnovers. On offense it was Hudson who seemed to be able to get to any spot on the floor he wanted, even against a tremendous Alabama defense, and knock down shots even with a hand in his face. 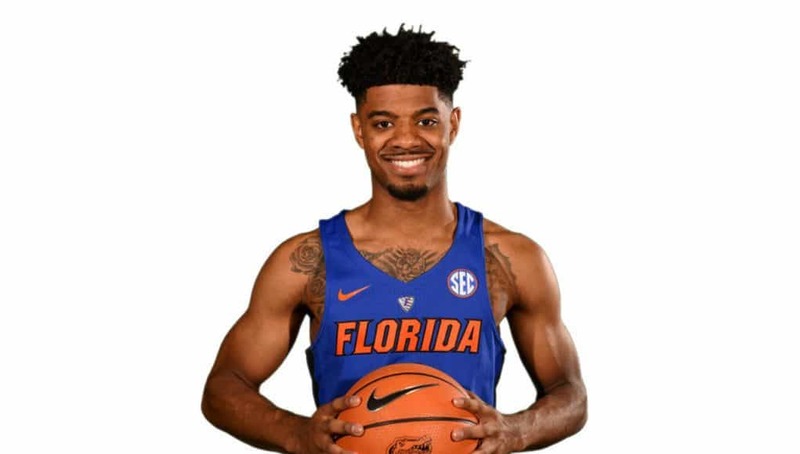 His 27 points on 9-13 shooting was the icing on top of the cake that was a great road win for the Gators that sets them up well for the SEC Tournament as well as seeding in the NCAA Tournament. In one of the most dominating defensive performances we’ve seen in, hey I’ll say it, all of college basketball this season the Gators went on a stretch in the first half that spanned over 17 minutes where the Crimson Tide shot 1-25 from the field. If that won’t make Coach White and the rest of the staff smile, I don’t know what will. Alabama finished the game shooting 30% from the field and 20% from three while turning the ball over 15 times, all numbers that point to Florida’s discipline defensively. This team has struggled to defend at times this season but have really picked it up at the end of the season which is as good a time as any to get hot. Jalen Hudson’s 27 points tonight were extra impressive because it was Alabama’s clear game plan to limit him yet he still got his shots anyways. His ability to get to the hoop was also big as he hasn’t always been eager to drive the basketball even when he has a favorable matchup. If he shoots the ball like he did tonight (3-5 from three) while also getting to the hoop like he did tonight he will be truly unstoppable offensively. If there is one area that Alabama out-executed Florida tonight it was on the glass where the Crimson Tide had 14 more rebounds than the Gators and hauled in 17 offensive rebounds. I think that offensive rebound number doesn’t tell the whole story as many of those rebounds were wild tip-back attempts on missed shots but it still showed that the Alabama bigs were working for better position than the Gators were. No team can play a perfect game of basketball and this didn’t end up hurting the Gators. Dontay Bassett earned another start after playing great against Auburn. Unfortunately, tonight didn’t go quite as well as some late rotations and fumbling of passes lead him to only get 5 minutes of play tonight. Michael Okauru and Deaundrae Ballard also got some run and though both are still learning high level college basketball they show flashes of the players they will ultimately become and it is exciting. Chris Chiozza tied the record for all-time assists at Florida with 547 (held by Erving Walker) early in the second half but couldn’t get that record setting helper. 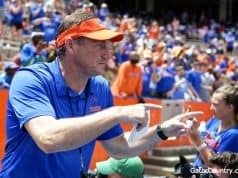 He will all but certainly get the record at home Saturday and I’m sure the Rowdy Reptiles will make it a special celebration. Andrew Fava, I see you! Getting in the game late he took a pass on the wing, attacked a closeout and got an easy layup on the right side. Always nice when the walk-ons can not only get in the game but put points on the board. Mak Krause also got in and was able to get an offensive rebound to keep a Gators possession alive. 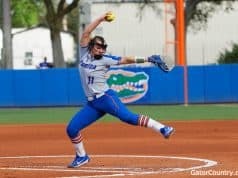 The Gators close out the SEC regular season with highly anticipated home game against the Kentucky Wildcats. Always a big game when these two match up this game has increased importance as both teams are jostling for both SEC and NCAA Tournament seeding. 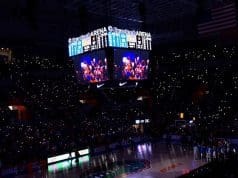 Florida won game one of the season series 66-64 in Rupp Arena but with a team as young as Kentucky is they are always going to get better as the year goes on so Florida could see a very different Wildcats team. Time to finish out the regular season strong!